(O/U 2.5) – You have to predict if the total number of goals scored during the entire match will be over or under the spread indicated. 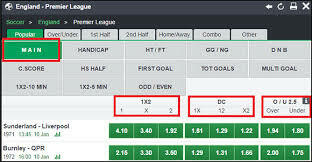 Handicap 1×2– When betting with a traditional handicap, points or goals are subtracted from the favorite team. If you bet on the stronger team, it will need to perform better than the handicap for you to win your bet (the handicap will be preceded by the sign “-“). The handicap will in fact be subtracted from its final score. Please note that the betting options are 1, X and 2, and that the standard 90 minutes play time has to be completed. C. Score– To predict the correct score of the entire match. You can choose from the given options. DNB– To predict which team will win the match. If the teams draw the selection will be void and will not be included in the computation of a possible bonus. G. Home– To predict the number of goals that will be scored by the Home team during the whole match choosing among the alternatives offered. G. Away– To predict the number of goals that will be scored by the Away team during the whole match choosing among the alternatives offered.